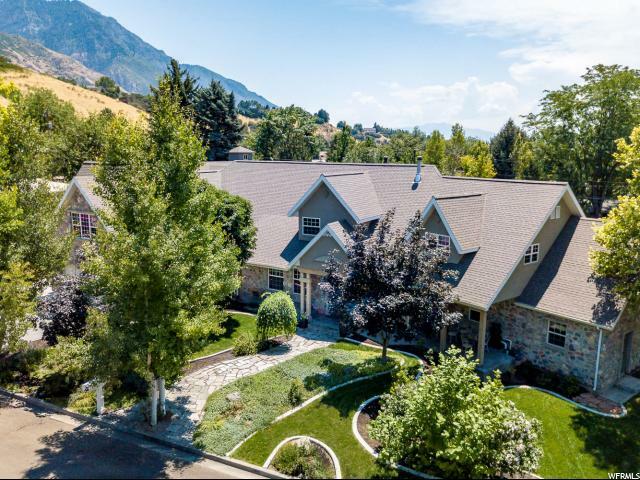 All Provo homes currently listed for sale in Provo as of 04/21/2019 are shown below. You can change the search criteria at any time by pressing the 'Change Search' button below. "BYU COUGAR FAN DREAM HOME! 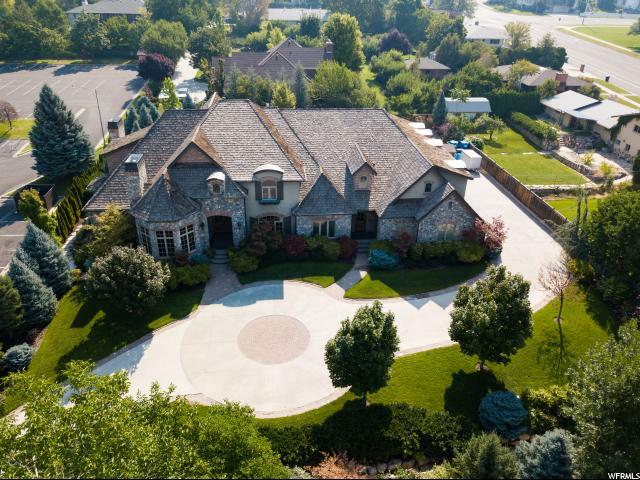 AMAZING LOCATION CLOSE TO BYU WITH A FULL-SIZE COUGAR-THEMED BASKETBALL COURT INCLUDING 2 HOOPS AND A DROP-DOWN MOVIE SCREEN. Tucked away in a quaint neighborhood near Rock Canyon, it boasts unparalleled views of Squaw Peak and Mount Timpanogos and offers unobstructed views of the Provo Temple. This dream home designed by Aaron Inouye not only has stunning decor throughout the house but also offers jaw-dropping entertainment spaces within. No expense was spared on this project starting with a regulation size racquetball court and full Basketball court that also doubles as a large theater with a drop-down screen and projector. Other fantastic spots within the house are on the floor above with a 50's themed kitchen and theater room. The heart of the main floor is the gourmet kitchen that includes a large island, Wolf range, double ovens, and a butler's pantry. The Kitchen opens to a large vaulted great room, dining areas, and a beautifully landscaped backyard. The Master Suite is set apart to provide a peaceful sanctuary with magnificent views of the Mountains. The Second floor includes uniquely designed rooms including a Train room. This is the perfect room for little ones who enjoy playing with remote controlled trains which circle around the ceiling overhead. The rock wall and fire pole in the next room will keep the older ones entertained as well. A full Mother-in-law apartment completes the home. This is a one of a kind home. Come see it for yourself. Buyer to verify all info to their satisfaction. " "Classic and contemporary style blend seamlessly together, to form this current and comfortable home. Located in the sought-after luxury community of Vintage on the River just below Provo Canyon, this collection of fine homes enjoys convenient access to year-round recreation, and a proximity close to some of the area's best restaurants and schools. No expense or detail was spared in the home's design. This home is one of the most spectacular within the community, with features unlike any other. The impressive entry showcases Brazilian teak hardwood floors. The kitchen is stocked with professional-grade appliances. The great room is complete with a floor-to-ceiling modern stone fireplace. Accommodations include many suites, a theatre room, music room, pool (with waterslide), billiards room, sport court, and an 1,800 sq. ft. gym. Other highlights include an in-ground trampoline, smart thermostat, raised garden beds, and a massive RV pad. There is also a separate guest house." "Welcome to the timeless architecture of the old world French Chateaux. 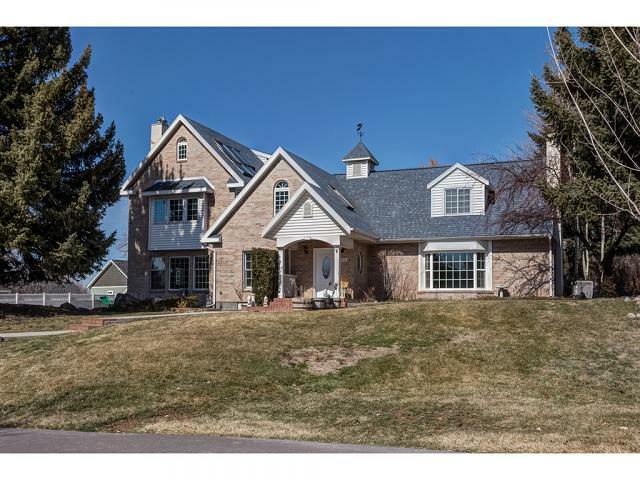 Nestled under the mighty Wasatch Mountains of Utah is located within the highly desirable community of Stone Gate. Situated 20 minutes from the famed Sundance Ski Resort, home of the highly acclaimed Sundance Film Festival. Stone Gate is the perfect place to call home for generations to come. There is an expansive courtyard complete with fireplace and private cafe' style chalet perfect for capturing the majestic mountain setting. More than enough space for guests and family to reconnect and get away from the world. This masterpiece mixes sophisticated design and stunning customizations with timeless finishes selected from around the world. As you step foot in the grand foyer you will be overwhelmed by the charm of the old world sophistication from the magnificent staircase to your gaze of the luxury found herein. Continuing your stroll you will come upon an exquisite gourmet kitchen with large island combined with a catering kitchen that includes incredible storage and countertop space to make this an entertainer's dream. After your evening of entertainment you will look forward to your master suite of pure elegance while your guest stay in one of three master suites. As can be seen by the photography taken, there was no expense spared when building Stone Gate's Finest: The French Chateaux." "2003 Parade of Homes Winner, exceptional floor plan, main floor living, gourmet kitchen, great room, home theater, elegant master suite, professional office, 6 car garage & additional motorcycle garage, heated driveway, tons of storage, mother-in-law apartment, vantage lighting control & automation system, game room, dance studio, indoor basketball court, large secluded back yard w/ water feature, incredible workout facility. GREAT HOUSE FOR A GREAT PRICE. SELLER WILL LOOK AT ANY REASONABLE OFFER. DONT WAIT. " 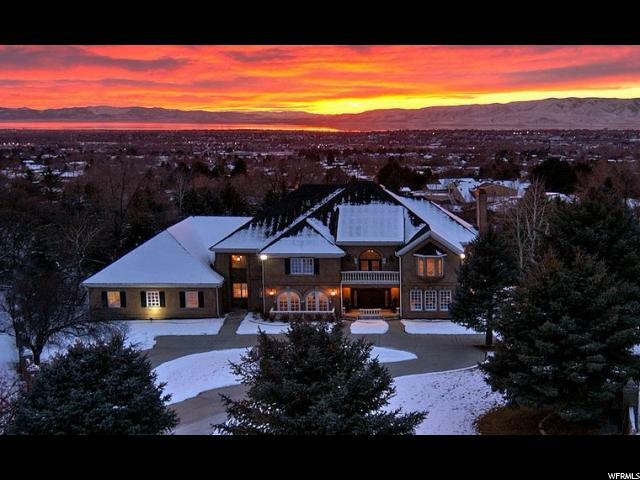 "Beautiful estate in Provo's Hillside Oaks community offers breathtaking 50 mile views. The lush landscaping and location create a private, one of a kind atmosphere. The magnificent interior is well designed and architecturally stunning, with lavish treatments, custom accents, high-end cabinetry and opulent stone finishes throughout. Convenient canyon access. Square footage figures obtained from county records are provided as a courtesy estimate only. 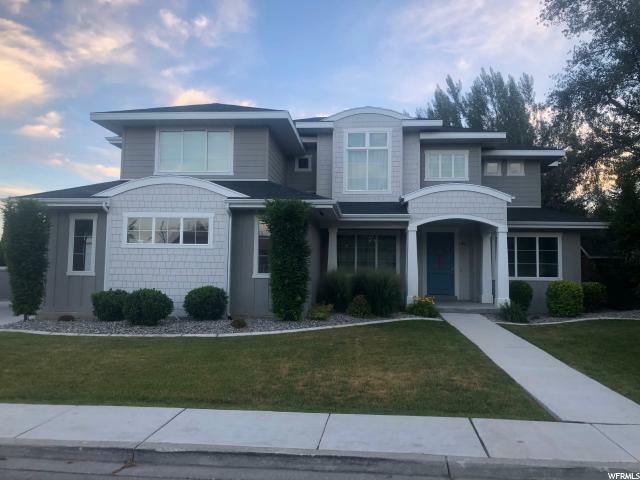 Buyer is advised to obtain an independent measurement"
"Don't miss the opportunity to live in one of the most sought-after neighborhoods in Provo, Utah! This home offers nearly 1.3 acres of lush landscaping resting in the quiet Woods at Riverside gated community . Relish in the drive home every day with tree-lined streets, breathtaking panoramic mountain views, and private driveway that leads to an impressive 3-car oversized garage that provides access to the two bedroom apartment above for in laws or family going to either Brigham Young University or Utah Valley just minutes away. An entertainers dream backyard provides an outdoor kitchen, pool with pool house and pergola for long summer nights. The kitchen completes every Culinary artist's dream with both a commercial grade Wolf gas cooktop, double ovens, side-by-side subzero fridge & freezer, 2 oversized islands, butler pantry, and a bake kitchen. Noteworthy interior details featuring extra wide hallways-exposed wood beams, hand-crafted stone hearth and elevator. You'll appreciate the convenience of having the master suite on the main floor with his and her walk-in closets which accompanies an en suite private retreat and indoor hot tub. 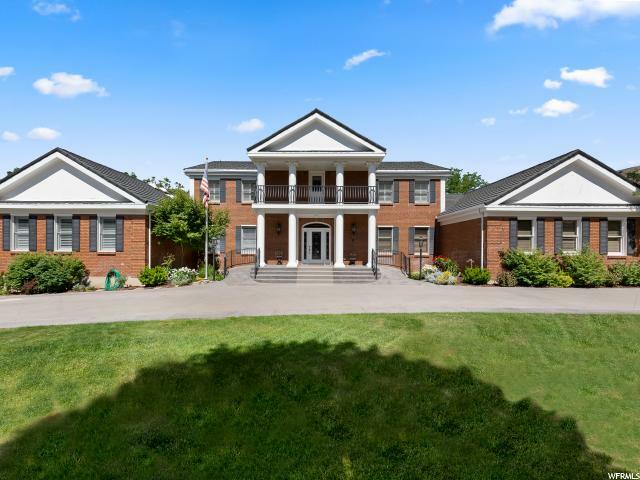 This home was built to entertain; boasting spacious family rooms, outdoor patios, and a mother-in-law apartment complete with interior and external access. Your loved ones will enjoy the endless outdoor entertainment this home offers; whether it's playing in the pool, a friendly sand volleyball game, jumping on the in-ground trampoline or lounging on the patio during a summer BBQ. Call to schedule a personal tour today! Buyer/Buyer's agent to verify all information." 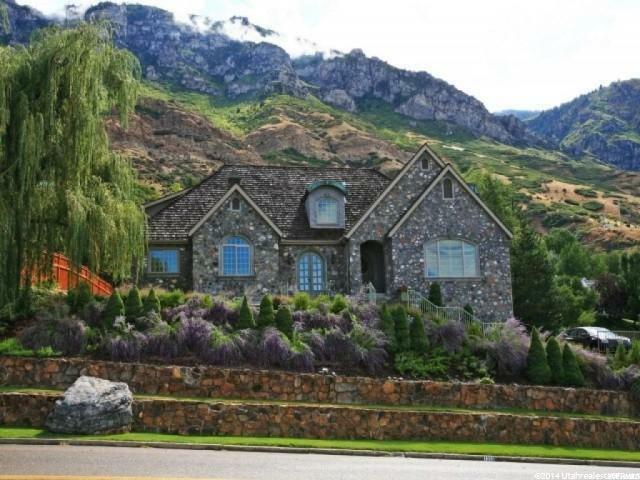 "Private family estate located on the east bench of Provo. You will not find another home or neighborhood like this on the market. This home is built for a large family and to entertain. The kitchen has Viking gas range, hood, Wolf double ovens & two Wolf convection microwaves, 2 Asko dishwashers, Subzero fridge, pebble ice maker and is very open and the center of the home. The large master suite offers a private deck with views of the backyard, pool, Cascade Mountains and valley. It also has a jetted tub, separate shower with 2 heads, double sinks, walk-in closet, and master office. There is an apartment in the basement with 2 bedrooms, full kitchen , full bath, and it's own laundry and garage, perfect for older children or live in help. There is also a walk out to the backyard, from the family room and access to the second garage. The garages can easily fit 7 cars so there is room for all your toys. Outside several hundred thousand dollars were spent on the pool, hot tub, retaining wall, and landscaping to make this a one of a kind flat yard perfect for hosting parties, wedding receptions, or just simply to enjoy time with your family. Please be sure to check out the photo's and 3D tour. SQFT is from county records, buyer to verify all." "*Located High on the East Bench of the Wasatch Mountains in a Cul De Sac*Private Setting Is Surrounded By Spectacular Mountain and Valley Views*Within Minutes to Hiking/Biking Trails, World Class Ski Resorts, Lakes and International Airport*Two Parking Access for Cars and RV's*Large Park Like Setting Yard With Mature Trees, Lighted Tennis Court & Pool*Grand Entry With Sweeping Staircase*Extra Large Rooms and Windows Bring the Outdoors Inside*Extra High Ceilings*Brand New Large Kitchen with SS Appliances & Pebble Ice Machine*Hardwood Floors*Grand Master Bedroom Suite With Private Walkout Deck*The Oversized Family Entertainment Gathering Room Over Looks the Extra Large Indoor Basketball Court*Lower Level Has an Extra 3,240 Sq. ft. That is Currently Dedicated to Play Areas, Workout Rooms and Lots Of Storage Space*Google Fiber Optics*New Roof, Carpet and Paint*Property Can Potentially Be Sub Divided*Buyer To Verify All Information and Sq Footage* "
"*NEW PRICE - Reduced $120k! Located in the prestigious Vintage of the River gated community, this sophisticated estate home abounds in custom workmanship. The attention to detail and superior craftsmanship is evident as you enter the grand foyer to experience 20-foot ceilings, pre-cast pillars, grand circular limestone staircase, and intricate iron banister. The custom woodwork, extensive vaulted ceilings, marble and wood floors throughout the main floor showcase the home. The great room is a masterpiece with its massive stone fireplace and built-in bookcases that complement each other creating a cozy environment. The gourmet kitchen is outfitted with top of the line Wolf/Sub Zero appliances, 2 dishwashers, 2 sinks, and an expansive granite center island with bar seating. The home is finished with exquisite leaded glass, plantation shutters, solid wood doors, and crown moldings throughout. The custom wood-trimmed ceiling accompanied with beautiful built-in's make the ideal main floor office. The spacious master bedroom on the main level offers his and hers walk-in closets, a huge soaking tub, dual vanities with a separate make-up counter, expansive bay window sitting area, gas fireplace, and a private patio with French doors. Three additional bedrooms with full ensuites complete the home. Two of the bedrooms, one built with a Juliet balcony and the other with a private veranda offer spectacular views of the Wasatch mountains. The home continues on a lower level with a mother-in-law suite accessible by a separate entrance with a full kitchen and bath. The dedicated high-definition theater room with stadium seating includes a high-end projector and components. The amenities continue with a built-in Fort Knox safe room, indoor basketball court, fitness room, game room, and multiple storage rooms. The detail in this home is incredible and is complete with a fully landscaped yard that is complemented by an outdoor swimming pool and waterfall feature. Build cost was $2." 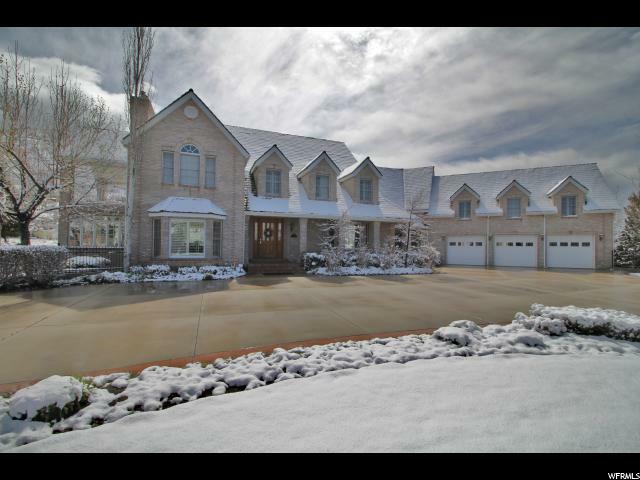 "Stunning East Bench Provo home in gated community-- minutes from BYU, Timpview High, Provo Canyon and Sundance. No detailed spared with over $800k in upgrades. Custom tile & hardwood flooring as well as wood built-ins throughout home. Main Floor living with Spacious Master suite with deluxe bath and sunroom. Open concept kitchen and family room with lots of seating for entertaining and huge fireplace. Amazing garage space-- with extra height and depth. Basement features indoor swimming pool, 2nd kitchen and grand stage for performing. 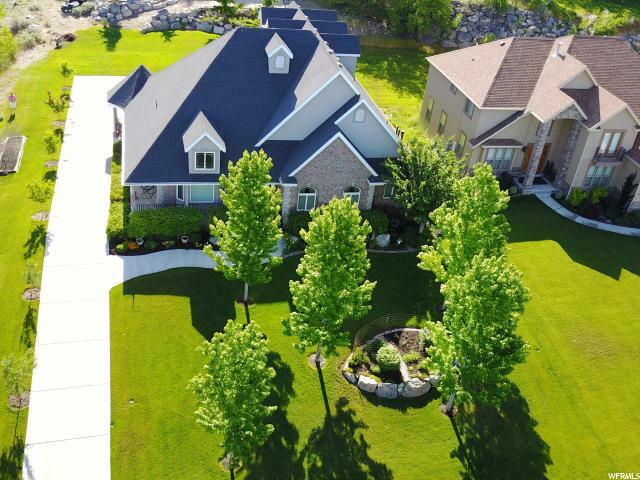 Impeccable landscaping with custom curb edging and mature trees. All furniture negotiable." "Location! Location!Location! Best area in Utah County by Riverwoods Mall, theater, restaurants, large park with tennis courts, river, and Sundance biking/walking Trails. Cul-del-sac, high ceilings, remodeled in 2018, basement finished for the first time in 2019, expensive white oak throughout, expensive Barlows cabinets, beautiful yard with gigantic water fall, heated garage, gorgeous carpentry work and real wood floors, 4K home theater, walk-out mother-in-law apartment with beautiful kitchen, 7 bedrooms. Had offers before, price lowered to sell fast. Owners are relocating." "This spectacular Riverbottoms home was featured in the 2017 Parade of Homes. 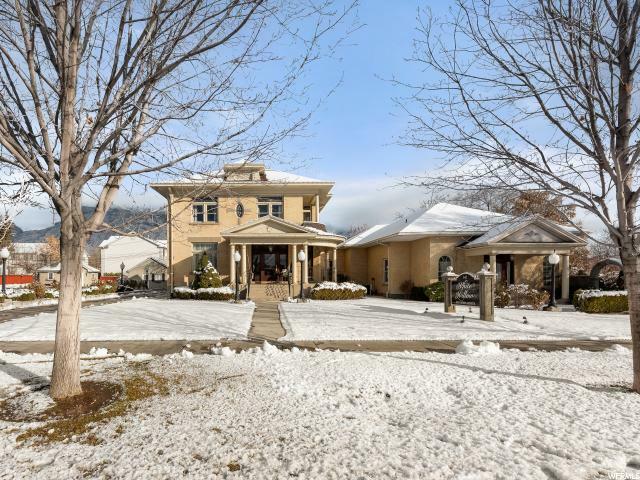 The home is beautifully set near the Provo River and is conveniently located close to shopping, dining, entertainment, and just minutes from Sundance Resort. Enough garage space for 7 cars and a detached garage/poolhouse with a studio apartment. This is a must see! Check the tour for videos. Sqft as per appraisal, buyer is to verify all information in the the listing." 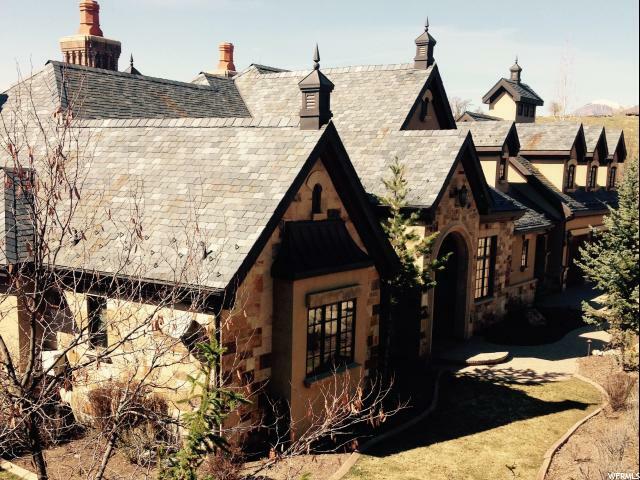 "This beautiful Historic Provo Mansion is a timeless masterpiece set on a highly visible location in Provo. Known currently as the White Willow Reception Center, formally known as the Thomas N. Taylor House. The home has been remodeled in a myriad of ways, including paint, multiple kitchens, flooring, and a fantastic update to the gardens. All this, while maintaining most of the original details of the original home, including flooring, woodwork, stained glass windows, pocket doors and other classically beautiful elements that will impress any visitor. Also in the property is included 2 additional rental units, currently occupied, and Provo city approval for a third to be added upon request. -- Please note, the zoning for this property allow for a variety of uses including commercial, residential and multi-unit. " "To view a drone video of the property go to the Tour tab at the top of the page. Gorgeous luxury custom one of a kind 2 story home, top quality upgrades throughout, must view online photos to understand the extend and quality of the interior design and luxury features, large corner double lot, desirable central location, prestigious Pheasant Green subdivision, full size out door tennis court with gazebo, Mother in Law or Nanny apartment with kitchen, main floor living, main foyer opens into large comfortable formal step down living room, dining room & separate high ceiling great room adjacent to large open kitchen with island, double ovens, beautiful built-in cabinets, Corian counter tops, very large 1000 sq. foot main floor master bedroom main floor suite with bathroom with double sinks, sauna room and large walk-in master closet, tall cathedral and vaulted ceilings throughout, 3 fireplaces, executive library with beautiful solid wood built-in cabinets and bookcase with custom spiral staircase, large bedrooms, dens, large storage rooms, mud room, security system, 2-50 gallon water heaters, 2 furnaces, large finished 3 car garage with work bench and over-head heater, out building/workshop, large covered patio. Square footage figures are provided as a courtesy estimate only and were obtained from the county records. Buyer/Buyer's agent responsible to verify all listing information including square footage. " "Designer home in the Prestigious Stone Gate neighborhood! Fully Finished! Centrally located in Provo's Riverbottoms neighborhood-- minutes to Canyon Crest Elementary, Timpview High School and BYU! Lot is ready to build with utilities nearby. Choose your own finishes! Featured in the Parade of Homes for great quality and craftsmanship. The Stone Gate HOA includes one of a kind amenities: sports court, clubhouse, infinity pool, immaculate grounds maintenance, and more. Lot is ready to build with utilities nearby. Design specifications and CC&Rs available on request. *Use our builder OR bring your own! *"
"South facing brick home with all the charm in the world! Amazing location within walking distance of the MTC, BYU Stadium, parks and other important landmarks in Provo. Incredible 1-acre yard with a footbridge, water rights, a lighted sports court, a large shed, lovely paths through the rose garden, cascading waterfall and a two story play house that has its own working lights and running water. Mature fruit trees, blackberry & raspberry bushes, grapes and other foliage fill the boarders of the property, making for a quiet and secluded space to enjoy. The home is full of reading lofts, hidden rooms, a chess board in the floor and other unique surprises waiting to be discovered. Gorgeous wood floors, natural light throughout! This is a special home in a one of a kind location! Come see and enjoy what it has to offer!" 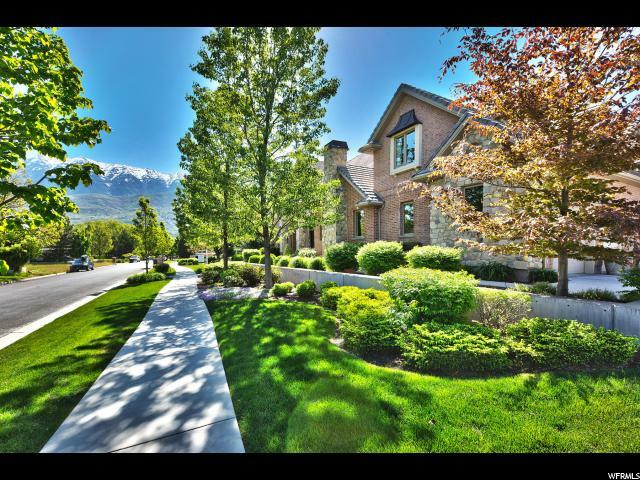 "Urban Estate in East Provo. 1.36 Acres of prime real estate with animal rights, mature fruit trees and irrigation shares available. Property includes 2300 square foot 3 bed 2 bath house with separate basement entrance and kitchen. A classic 2 car garage/barn and work shed are included. This property has a recorded subdivision permitting 5 building lots, or buyer can keep the acreage together as your own private haven under the shadow of Squaw Peak. Close to BYU and walking distance to local schools. " "A very desirable location where the mountain is literally your back yard. Features include large master suite w/ Jacuzzi, tons of storage, 2 full sized kitchens, 2 laundries, central vac, a drinking fountain in the mud room, 10' foot ceilings in basement with a ramp up to the garage, a playground with ball court, swings, tramp, a wrap-around porch w/ gazebo, fruit trees, professionally landscaped, premium .58 acre lot with views, an oversized 3-car garage, super neighborhood, with a road to or from nowhere, close to BYU and Provo downtown yet essentially no traffic." "Have you dreamed of living in a mountain setting while enjoying easy access to city life? Now is your chance to own your dream home in the highly desirable neighborhood of upper Springdell, just 5 minutes up Provo Canyon. This beautiful multi-level home has been thoughtfully and thoroughly renovated, with an emphasis on a comfortable, natural flow that brings the great outdoors inside. The main level has a graceful, open concept with oversized windows in every room, allowing for light to softly filter indoors while maintaining total privacy. The naturally dark acacia wood flooring anchors the straight, white walls and high ceilings. It is an art collector's dream. The wrought iron and oak staircase is a masterpiece to be admired. The kitchen is an intelligently designed triangle between refrigerator, stove and sink, with ample counter space and a walk-in pantry that provides plenty of storage space. Kitchen and dining room look onto an elegant patio, backing US Forest Service Land. The master suite is a model of luxury, with a jetted tub, European-style shower, extra large bedroom, and a walk-in closet large enough to be used as an office or nursery. The laundry room and half bath complete all that is necessary for main floor living. Upstairs, an open loft large enough to be a library is a welcoming space for reading or games. The basement has 8 ft. high ceilings, a large family room, a bathroom, and a cold storage closet. It also has an exercise room that could be used as another bedroom. More storage is available in the basement and in the garage. Springdell is a unique community offering many amenities, including 40 shared acres, a tennis court with basketball standard, garden plots, horse property, and a pond, as well as hiking and mountain bike trails that access the Forest Service land. It an easy walk to Bridal Veil Falls, a quick 10 minutes to Orem, 15 minutes to Sundance and BYU, 20 minutes to Heber, 30 minutes to Draper or Park City. 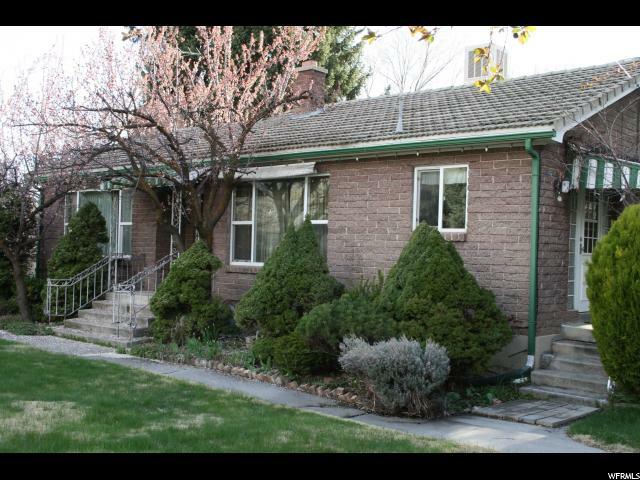 Minutes away from worl"
"Rare find in Edgemont neighborhood of Provo - new home with huge yard and mature trees! Curb appeal for days!! Amazing views of Mt Timpanogos from rear. Close to BYU and great local schools including Edgemont Elementary (French Immersion) Centennial Middle and Timpview HS and just two blocks from Days Market. High ceilings and expansive windows throughout. A garage that will make you swoon. Whole house audio. Security cameras outside. Smart home features throughout. Square footage figures are provided as a courtesy estimate only. Buyer is advised to obtain an independent measurement." "French Country Style with an attic truss. Decks, patio, sport court, irrigation, radiant heat with central air. Square footage figures are provided as a courtesy estimate only and were obtained from the county. Buyer is advised to obtain an independent measurement." "Why buy a house when you could own a castle? Great for entertaining or relaxing and enjoying the beautiful view and sunsets. Viking appliances, gourmet kitchen. 10' ceilings, 3 fireplaces, Fully finished basement with Kitchen. Versatile family room with Kitchenette. The ceiling mural must be seen to appreciate. This house in the Oak Hills neighborhood could be your very own castle. Square footage figures are provided as a courtesy estimate only and Buyer is advised to obtain an independent measurement." "Stunning Two Story Modern in Secluded Neighborhood, Open Floor Plan with Vaulted Family Room, Gorgeous Kitchen with 9ft Island, Double Oven, Tile Backsplash, Stainless Steel Appliances, Master Suite with Step Ceiling, Dual Vanity, European Glass Shower, His & Hers Closet, 3 Additional Bedrooms, Oversized Mudroom, Start Selecting Your Options Today! " 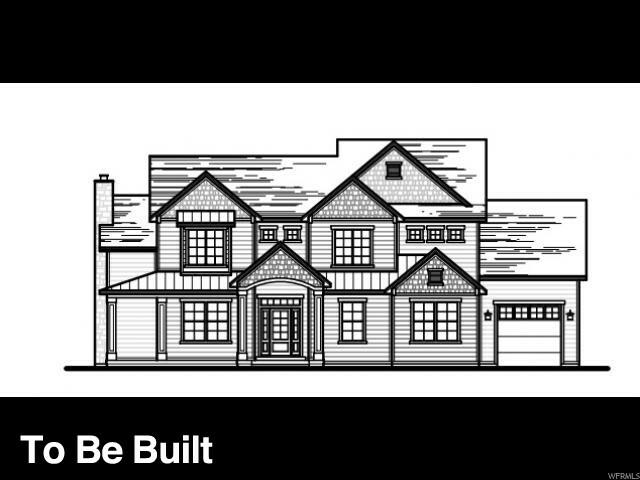 "Come Build this Stunning Popular Custom Floor Plan! Nestled in a Family-Oriented Neighborhood, It Features: A Spacious Family Room with Gas Fireplace, Decorative Millwork Throughout, Barn Doors, Custom Kitchen with Stainless Steel Appliances, Master Retreat with Oversized Walk-in Closet, Dual Sinks, Freestanding Tub and Shower, 9 ft. Ceilings on All Levels, Exterior Fully Wrapped in Hardie, 3 Tone Paint, Come Start the Building Process! "